Peel your apple and dice it. I added this to about 3 1/2 cups of water. Bring to a boil. Let boil for about 5 minutes or so. Just until the apples are soft. Add your oats and the remaining ingredients. Simmer until oats are completely soft. About 5 minutes. Remove from heat. This is when I taste tested it. Mine needed some more brown sugar, so I added a tad more. It really just depends on how sweet you want your oatmeal. I also added flaxseed for a healthy boost! Serve steaming hot or top with a bit of milk. This cools it down for little mouths and is really good. Try it, you might like it. So there you have it simple, homemade oatmeal. Why buy store bought, when you can make your won at home? I was watching the Today show the other day and they recommended something I've been wanting to try. 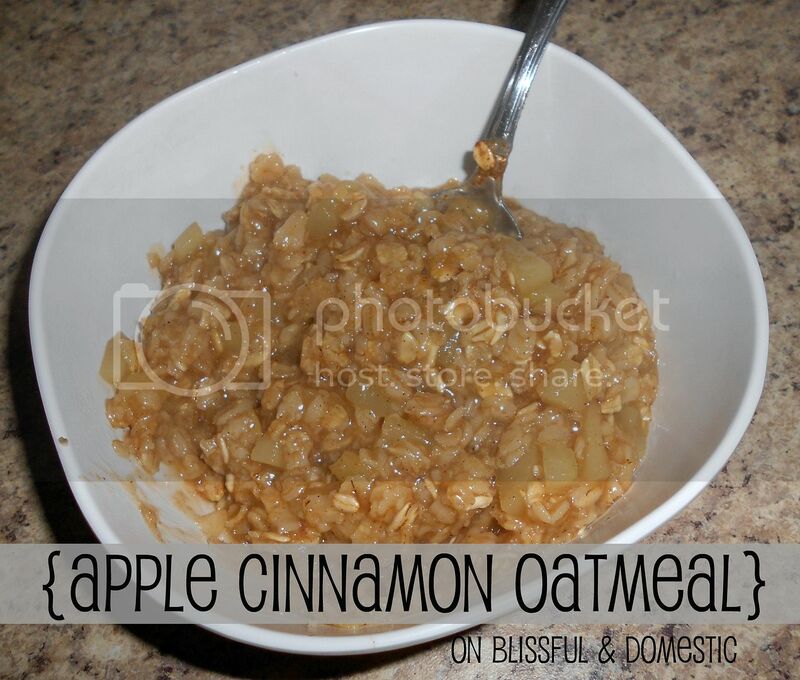 I am a HUGE oatmeal girl :-P They suggested cooking steel cut oatmeal in the crockpot on low the night before with whatever fruit you want and it will be ready for you the next morning - no muss no fuss. I don't know why such a stupid trick hadn't occurred to me! I make a batch of steel-cut oats once a week using an 18oz box of Hodgson Mills Steel-Cut Oats and 8 cups of liquid (milk, vanilla-chai tea, water, etc).Combine in large saucepan, bring to a simmer and cook about 3 minutes. Ladle into pint-size, wide-mouth Mason jars and screw on the lids. Leave to cool on the counter for a couple hours then put in fridge. To serve, just heat for about 90 seconds on high in the microwave, add cinnamon, ginger, brown sugar, raisins, flaxseed, milk, or whatever else you want. REAL oatmeal in the morning for about the same time as instant! and soooo much better! When making your own oatmeal, try using juice instead of water to add extra flavor and eliminate sugar/sweetners. I use apple juice or whatever is on hand. Top with milk and banana. Oh, yes. Throw in a handful of raisins before cooking in the microwave. Quick and easy and SO much better than the bought stuff. Thank you so much for your fantastic ideas!!! I find that homemade oatmeal is so sweet from fruit I don't need any sugar or butter, so they're more healthy AND taste better! I make old fashioned oats with milk, a pinch of salt, and these mix-ins: 1) fresh apple sliced, cinnamon, ginger, raisins, sliced almonds 2) fresh banana sliced, craisins, sliced almonds 3) dried apricots sliced, sliced almonds 4) craisins and sliced almonds. Still want to try... 5) fresh pear sliced, ginger, vanilla 6) dried plum (prune) sliced, cinnamon, nutmeg, allspice, sliced almonds. More ideas here: http://www.theyummylife.com/Refrigerator_Oatmeal. Just made this for breakfast this morning! YUMMY! I just started following your blog and have taken the first step in meal planning! I have all of our meals planned out for a week! I'm so excited! I already feel a weight lifted because I don't have to stress about what to make for meals today or the rest of the week! LOVE IT! Just made for breakfast this morning! YUMMY!!!! Thank you! I just started following your blog this week and I am so excited! I planned out meals for the whole week and went grocery shopping last night. So excited to start this! Huge weight is already lifted off my shoulders since I don't have to try to come up with meals anymore! yay!! How many servings does this make? I would like to make a large amount and separate it out for each morning. Would that work? It does about four servings. You could totally portion it out and then use it throughout the week. Such a great idea Amy!